I love the dress and is that a cape? So elegant, so ladylike. The back of the dress is below. 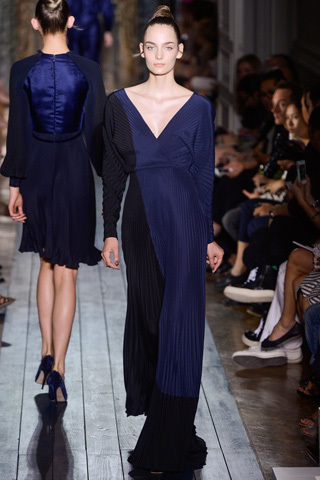 I adore this navy and black plissé dress. I love the different textures shown here. This almost feels medieval to me. Somebody should get married in this dress. Pier Paolo Piccioli and Maria Grazia Chiuri, Valentino co-designers. That shade of blue is absolutely one of my favorite colors so I had to pull out my Revlon nail polish from a couple of years ago, Midnight Affair, and also my blue rectangle sequined tank I bought last year at Kohl’s. This is one of the reasons I love watching the couture shows—I’m always inspired by the colors the designers feature and sometimes seeing couture makes me shop my own closet! 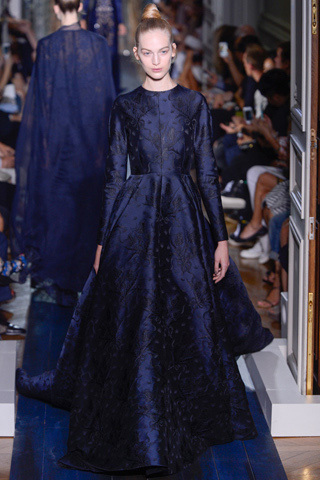 All Valentino couture pictures from Style.com. Thanks for the report. Valentino was never a designer I followed, probably because he wasn't edgy enough to suit the younger me. But holy moly those dresses are just beautiful. 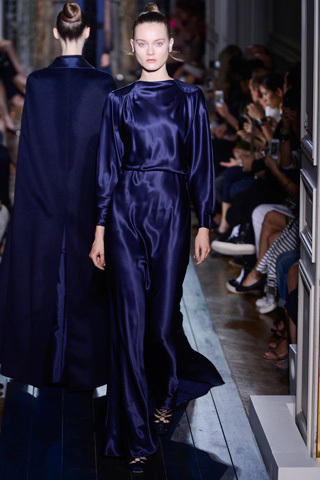 Isn't that midnight blue just divine? I love it. Midnight blue: my color, and I want it now! I ADORE VALENTINO the man and of course his designs are glorious. The documentary on his life and every brief interview I have ever seen with him makes me wish I could be in his presence even for a moment from afar would be fine. 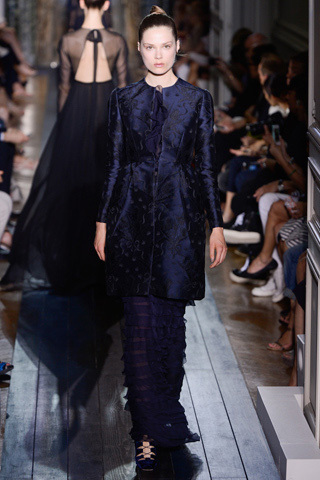 The designs and the midnight blue color is divine and a wonderful reflection of Valentino the artist. Love the midnight blue. I'm usually a cobalt girl, but this post makes me want some midnight in my closet! Everywhere I go where fall clothes are coming out, this color of blue is there...it looks huge for the upcoming season and it is beautiful. I have a tank that looks exactly like the one you showed in the last picture. The clothes are beautiful...Thanks, Jill! I love, love the dresses and the shade. I love Valentino the man and the artist very much. I don't wear much blue...not sure why? You've got me thinking blue now. Absolutely stunning gowns! What a gorgeous colour so much more flattering than black. I wish I could find more styles in this hue. I love the color and the "medieval" looking dress in particular.